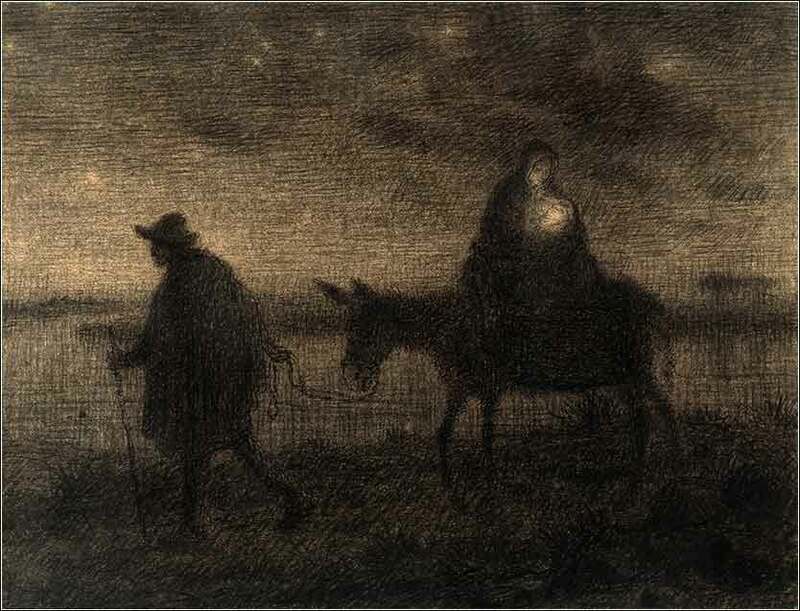 The Flight into Egypt by Jean François Millet ca. 1864. So Joseph got up, and taking the child and his mother with him in the middle of the night, set off for Egypt, where he remained until Herod’s death. This again is a fulfillment of the Lord’s word spoken through the prophet — ‘Out of Egypt I called my son’. We said in the Introduction that two of the great themes of Matthew were “Christ as King” and “Christ as the fulfillment of the prophets.” We saw the first of these abundantly in Matthew 1 and the first verses of Matthew 2. In the later verses of Matthew 2, we see the second fleshed out. We are fortunate to have just read Exodus, for the quote from Hosea — “When Israel was a child, I loved him, and out of Egypt I called my son” (Hosea 11:1) — resonates with the full meaning of both Old and New Testaments. During the descent into widespread idolatry that characterized the reigns of the post-David kings, God commanded Hosea to marry an unrighteous woman. She lapsed into notorious adultery after their marriage. Hosea denounced her and sent her away; but he repented his action and, rather stoning her to death, forgave her. If this sounds familiar, it is because Hosea's life and writings were, like the life of Moses, a parallel to the life of Christ, a preliminary chapter that formed a pattern which the Messiah would realize fully. Think of a dressmakers' pattern, first made in flimsy paper, then perhaps sewn in muslin, as nonverbal “prophesies” of the final dress. So the quote from Hosea turns our attention not to the words spoken by the prophets, but to the events they lived through. In Exodus, after God has made his promise to Abraham, the Hebrews are taken into slavery and then delivered by Moses and the first covenant into Canaan; but they violate the law — in effect, committing adultery by worshipping other Gods. In Hosea, Hosea himself is a metaphor for God as the cuckold husband of Israel; the book draws a distinct parallel between Hosea's marriage and the relationship of God and the Hebrews. Hosea's forgiveness of his wife is a rudimentary pattern anticipating God's ultimate act of forgiveness. Thus, Hosea prophesies the doctrine of righteousness by grace that will come to fruition in the life of Christ. That Christ actually goes to Egypt and returns is either a happy accident or else a nice integration of symbolic detail, tying the Old and New Testaments together. But much more important is Hosea's metaphor of God as the husband of adulterous Israel; for the metaphor of Christ as the bridegroom will inform the entire Gospel.